Paddy C. Courtney left his job as an accountant for EMI Records in July 1998 and hasn't looked back since, except to get the odd free CD or DVD! 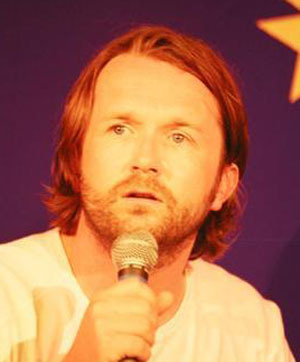 His comedy career started in The Comedy Cellar (Ireland's longest running comedy club), which he also ran and was the resident MC and host of for nearly five years. As an accomplished act, he is a veteran of the Edinburgh Fringe Festival and has been a regular at the invite only Cat Laughs Festival in Kilkenny for the last 7 years. He has toured the UK and Ireland extensively and performed in Europe and Asia too. He is one of Ireland's most sought after MC's and has worked with a whole host of national and international comedy stars and a wide range of acts from magician Keith Barry to the terrible twins, Podge & Rodge in recent times. As a result of his MC work, he has performed the duties of television warm up act for most of the live shows on RTE and BBC. Culminating in a gig for BBC Music Live in May 2004 where he performed to a crowd of 18,000 at Belfast City Hall along with Westlife, Ronan Keating, Bob Geldof, Alanis Morissette, Ash, Jamie Cullum, Katie Melua, Divine Comedy, Gabrielle, Hot House Flowers, Moya Brennan, Zucchero and Kila. In recent times Paddy has studied at the world renowned Gaiety School of Acting and has appeared in a number of BAFTA and IFTA award winning television dramas and short films: The Clinic (RTE), Custar's Last Stand Up (BBC), Yu Ming is Ainm Dom (18 awards) and Fluent Dysphasia (9 awards). Paddy secured his first lead role in the comedy short film 'Mebollix' in 2006 and since then has gone on to play the lead role in the six-part drama series 'Paddywhackery', which he also co-wrote with the director Dan O'Hara. This is due for transmission in October 2007.